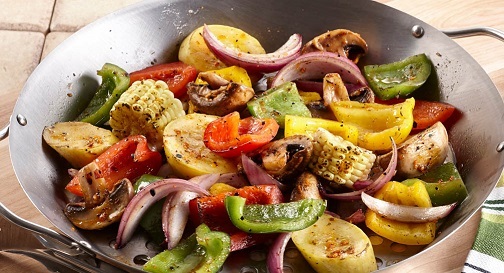 This Grilled Vegetable Recipe is absolutely one of the recipes that has sustained a restaurant for over 30 years. And it is so easy! This customer requested vegetable recipe is wonderful with Grilled Salmon with Lemon Herb Butter and Marinated Grilled Chicken with sweet corn salsa or London Broil. Preparation time: 20 minutes. Servings: 6-8. I also enjoy grilling or roasting other combinations of vegetables. I especially like to add Portobello mushrooms or shiitake mushrooms or chantrelles or others into the mix. Leftovers? Cut the remaining veggies into smaller pieces and refrigerate for tomorrows omelets or frittatas! There are many other vegetable recipes on the website for you to try. Don't forget to check out the recipe for roasted vegetables. Thank you for your desire to cook with confidence and style. Thanks for visiting the website. 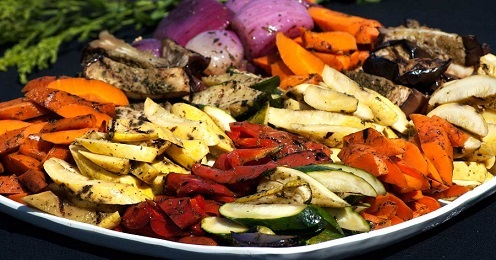 Enjoy your grilled vegetables and the company of those you share it with! Click the links or tabs on the pages to discover more great vegetable recipes requested and approved by restaurant customers.